Mailing List Studio is a desktop software for creating and efficiently managing your email marketing campaigns, above all if you need to send large quantities of mail to customers. This program offers all the most popular mass mail tools in a single product, without subscriptions and monthly costs. Easy to use, Mailing List Studio is recommended both for big companies and for beginner marketers: management the target is quite simple indeed and could be customized with a number of specific fields to include other unique information to better segment your lists and the search function allows you to find the desired user quickly. You can then create your newsletter directly within Mailing List Studio HTML editor, a comprehensive tool that let you customize your email messages at their best, formatting text, adding images, animations, and videos. 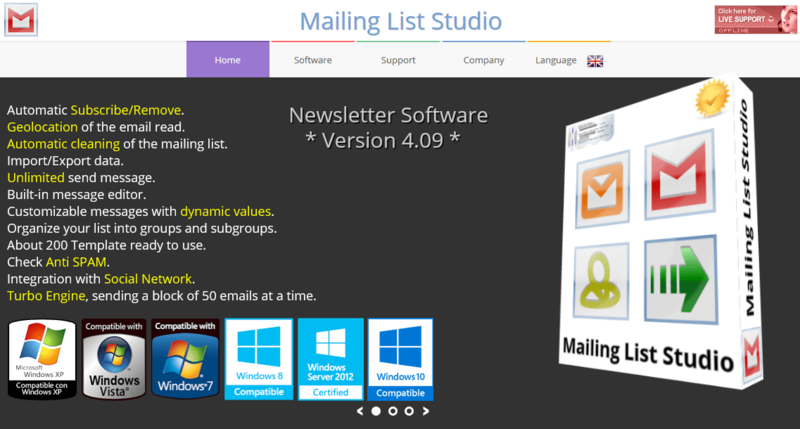 Mailing List Studio software is now at its fourth – available in both freeware and professional version – with no monthly fees or subscriptions, with a one-time payment and unlimited license that doesn’t expire. And with the last upgrade you can also manage and send SMS campaigns. Mailing List Studio is a reliable and comprehensive email marketing software solution that helps you send newsletters and manage easily e-mail subscribers.